Above is a full-screen view of the triple-ring chart with event directions and transits for the day, along with the 22.5 Distances + Halfdistances table summarizing major trends affecting that date and the following year. Double-ring and triple-ring charts allow you to work with and combine natal, directed, and transiting factors for complex analysis, still offering the same convenient dynamic dial functions provided with the standard single-ring natal chart. Additional Extra points, specified manually by you, can be added to the 90° dial to analyze how they fit into midpoint and cluster patterns. This allows you to manually enter the longitudes of planets or points from other charts or, locational/geodetic angles, and integrate them into the data tables as well as the on-screen or printed dial. 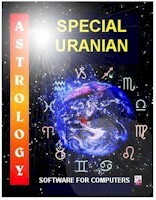 In providing for a scientific approach to astrology, the Special Uranian incorporates consideration of psychological factors inseparable from an objective appraisal of astrological influences on human beings. While cutting out early deadwood techniques that today's astrologers have studied and discarded from practice as they advanced in knowledge and insight, the Special Uranian program truly lives up to the task promoting "The Astrology of Tomorrow" as envisioned by pioneering midpoint astrologers of history such as Alfred Witte and Ludwig Rudolph. This program runs on Windows XP, NT4, ME, Vista, Windows 7 and Windows 8; and will run on Mac IF you already have the VirtualPC program installed. The Uranian Mandala is a relatively new humanistic/transpersonal psychological assessment tool integrated in with the longer-established standard midpoint diagnostic and prognostic methods developed and refined by Alfred Witte, Ludwig Rudolph, and Ruth Brummund. The Mandala, developed by Ruth Brummund, is based on principles similar to planetary weightings, but derived from the mathematical realities of midpoint and cluster structures, rather than the variable and questionable medieval and classical paradigms of signs, houses, dignities, detriments, exaltations, falls, etc. It was designed as holistic assessment tool to gain a personality overview in one single chart, revealing personal strengths, as well as key life and personality issues needing resolution for maximal personal growth. Responses of professional psychologists and counselors to readings of the Mandala attest to its value in pointing out key personality complexes and challenges. Calculation of the Brummund Uranian Mandala, which was formerly a long and involved procedure when done manually, is now implemented with relative ease thanks to Aureas Software's Special Uranian Program. In the case of overlaps between the 3 primary axes, the program allows the astrologer to manually choose alternate axes according to the relative significance of planetary factors shown in the 90° natal chart, per guidelines set by Ruth Brummund. Specifics of planetary midpoint axes relating to the Mandala can be readily accessed in table format. Basic Uranian and non-Uranian research functions carried over from Aureas' other research-oriented software programs allow you to do your own basic research on Uranian midpoint structures, testing for yourself the effect and effectiveness of Uranian methods and structures. The program also allows you to study the Transneptunians in the Gauquelin sectors, showing which of them near the MC and Ascendant correlate with professions or other personality characteristics. The program comes with individual files of birth data for professionals, organized by category, for observation of patterns relating to individual professions. All these functions contribute to the Special Uranian Program's status as one of the more precise, professional, and scientifically-oriented of astrological programs available anywhere today. The Aureas on-screen time zone documentation is based fundamentally on renowned astrological research analyst Françoise Schneider Gauquelin's reference Problèmes de l'heure résolus pour le monde entier, with substantial additional details gathered on the complexities of US and Canadian time changes derived primarily from federal, state, provincial, and local government documents or agencies. International time zone and change data has been further developed through thorough data research. The built-in beginning lessons, coupled with extensive on-screen help documentation makes the learning of program operation and capabilities more accessible than in programs where you have to flip through the pages of a book for a week to learn how to use its functions. 90° (4th harmonic) chart with precision on-screen moveable precision calibrate dial that quickly directs to precise midpoints, or specified degree; advances or regresses according to specified degree and minute; rotates 22.5° quickly with 2 clicks of the mouse, to view additional 16th harmonic midpoints. Prints out clean and clear charts on paper for use with 8, 10, 12, or 15 centimeter precision midpoint dials. Resizable charts, graphs, and tables. Click and drag the corner of graphics windows displays and charts and graphs contract or expand proportionally, including the on-screen 90° dial. This allows you to display several objects on the window simultaneously, or to display a word-processing file alongside a chart or table/s, for writing interpretations or articles. MS Word and Wordpad can be called up from inside the program. Entire chart quickly enlargeable to full-screen view with a double-click of the mouse, allowing you to visually focus on the chart only, or see details more clearly on smaller computer screens. Planetary glyphs on chart enlargeable and reduceable to match your visual capacity or preference. Pragmatic pre-set color scheme allows you to quickly identify the main points and midpoints, distinguishing them from other, less powerful background midpoints. Choice of various international astronomical and astrological glyphs for Uranus and Pluto, to match with regional variations. Dual dials for transit, solar arc direction, synastry, and other functions. Tables of complementary arc distances and half-distances, allowing for quick assessment of trends based on solar arc principles. Universal solar ingress charts, for assessment of political and social trends. New Moon charts, for assessment of monthly trends. Triple Uranian natal-transit-direction chart for prognostic work and rectification, with date quickly altered via single entry, and including all dynamic dial functions indicated for 90° natal chart. Extra points for investigation, entered manually, and then displayed on the chart, and in tables, along with other planets and points. Convenient and quick on-dial forwarding, or reversal, of planets, points, or midpoints for rectification procedures, by age in solar arc, date in solar arc, or specified number of degrees and minutes. Calculates charts for years 4000 BC to 8000AD, based on the Aureas ephemeris generator for the world-renowned 150-year New International Ephemerides. Convenient 22.5° midpoint tables for natal analysis, prognosis, and chart comparison. Convenient built-in on-screen introductory lessons on how to use the program. These get you started with a presentation of most all routine functions and capabilities of the program. Developed by Aureas, convenient and thorough built-in on-screen help documentation replaces the more cumbersome traditional paper manual, and includes an integrated search function. This eliminates the need to stop and page endlessly through printed manuals for answers. Cut and paste charts, graphs, and tables readily converted to graphics files to publishing or information exchange in text documents, e-mail transmittal, or webpage graphics. 22°30' linear/graphic ephemeris for transit analysis (includes transneptunians, and display of any selected transiting midpoint). Ability to select specific 22°30' (16th harmonic) midpoint lists for study and research, and to decrease orbs to isolate the stronger midpoint configurations. Size of text in tables resizable for those who want smaller or larger print. Fixed Local MC and Ascendant (per Grimm) for up to three cities can be added to a single chart for mundane and relocation midpoint and cluster analysis. Midpoint interpretations from the acclaimed annotated Brummund Rulebook. These are among the most concise yet comprehensive midpoint interpretations available today, based on the many years of experience of Hamburg/Uranian astrologer Ruth Brummund. Individual files of birth data for various professions (for study and research purposes). Includes nearly 3000 European and international professionals and other personality categories. You can manually add new chart data to these files, and import files from other computerized databases for more comprehensive research. Inquire about source files to see where convertible. Basic functions for routine research (via midpoints or via Gauquelin angular sectors). Allows you to select only those charts with given 3-planet midpoint, or 2-planet cluster configuration and study each chart individually for other planetary configurations. Note: Special Uranian is the only software program that is legally authorized to include the text of the English version of the Brummund Rulebook (c1990, 2003), or the Uranian Mandala. Proceeds of the sale of this program go to maintain and further the educational and research objectives of the Uranian Institute for Astrological Study and Research. Because conversion to US$ is required, no extra fees are asked for international postage or handling from other countries when paying by money order or band draft/cashier's check. THERE IS NO PRINTED MANUAL FOR THE PROGRAM... IT IS REPLACED BY AN EXTENSIVE SERIES OF ON-SCREEN HELP DATA, WHICH CAN ALSO BE VIEWED AS A FULL TEXT FOR STUDY, ON-SCREEN, AND PRINTABLE TO YOUR PRINTER. The program may be ordered by post, if payment is made in US dollars, preferably by money order or Western Union money draft. ** You can arrange to download the program via internet with security codes, greatly shortening the wait period required for shipment via post. Please contact blake@uranian-institute.org for further information.